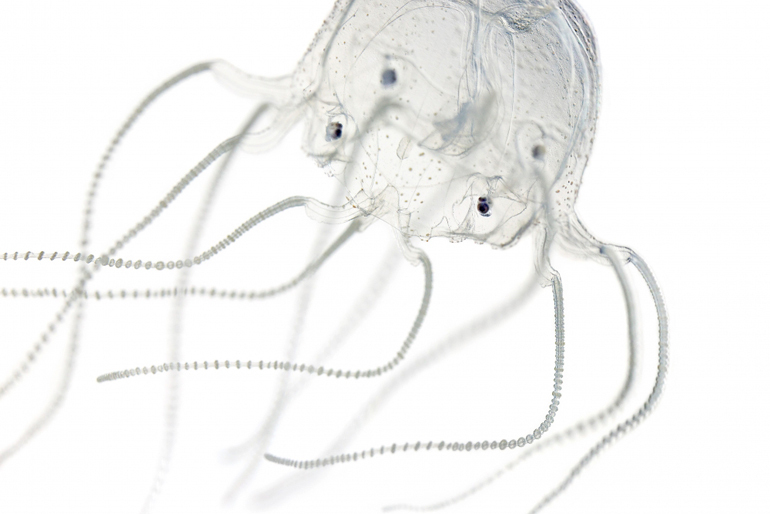 Eyes originated at least eight separate times among the cnidnarians, a group that includes jellyfish. The findings help illuminate how evolution produces complex visual organs. “Eyes are one of the most complicated organs that scientists study,” explains coauthor Todd Oakley, a professor in the University of California, Santa Barbara’s department of ecology, evolution, and marine biology. Researchers compiled a large genetic data set from which they inferred relationships among cnidarian species. Their findings appear in the journal Current Biology. Eyes detect light and convert it into electrochemical impulses in neurons. The process is the precursor to vision in complex beings. Yet some simple organisms, such as jellyfish, also have many types of eyes that use the same photoreceptive proteins, called opsins, as animals like flies and humans. The investigators coupled their genetic data with an extensive literature search to tease out the historical expression of photoreceptive opsin proteins in cnidarians. In previous research, Oakley’s lab found that opsins are used outside of eyes in cnidarians to trigger the firing of stinging cells called cnidocytes. The new study shows that not only was there widespread light-sensing behavior in eyeless jellyfish, but also that complex, lensed eyes in this group had a separate history from other eye types. These findings demonstrate the concept of convergent evolution—the independent origin of similar features in species of different lineages. Convergent evolution—which also occurs in plants—creates analogous structures with similar form or function that were not present in the last common ancestor of the group. Additional coauthors are from UC Santa Barbara and Ohio State University. The National Science Foundation and Scientists Without Borders supported the work.